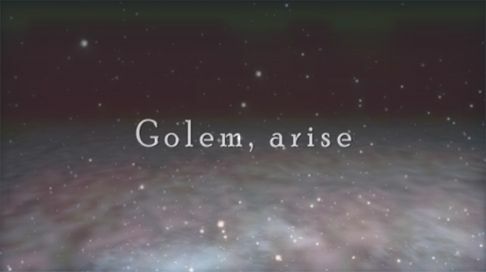 "Golem, arise" is MFX's demo for Stream'06, which was held in September 2006. With a duration of 3 minutes, it's a short but impressive "story" demo for Windows, based on OpenGL. Upon starting the demo, you can choose between 4:3, 16:9 and 16:10 in order to make the demo fit the aspect ratio of your screen. The demo is optimized for 16:9, so with the usual 4:3 aspect ratio you'll get to see black bars on the top and the bottom of the screen. The whole demo is set on a lonely landscape. It's snowing heavily. All of a sudden a kind of explosion happens, looking a bit like the impact of an atomic bomb. At the place where the explosion occurred, two creatures appear. They first look like tarantulas, but the texture of their bodies changes several times - not much time passes until they lose their coats and start looking more metallic-like. The poor creatures try to move, but their bodies are not well constructed and so they are only able to walk slowly and clumsily. That's the demo, basically. At the end we get to see the shade of somewhat more human-like shapes in front of the sun, and the credits appear. The soundtrack suits the short and "noisy" presentation very well, without being annoying at all. There are distorted vocals of a human speaking very slowly (just fitting the tarantulas' movements) and adequate instrumental sounds. All in all it's another fine work of the Finnish veterans and worth the less than 5 MB of download.